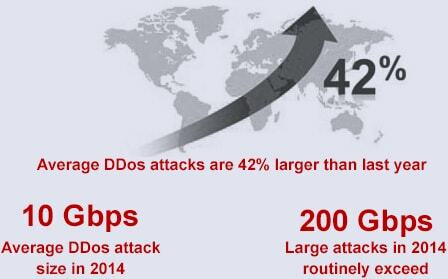 Don’t have your websites go offline by overwhelming traffic due to DDOS (Distributed Denial of Service) attacks!!! In the last 12 months, we have seen a 240% increase in visits by DDOS bots. These bots are not only becoming more common but the attacks which they perform are steadily growing. 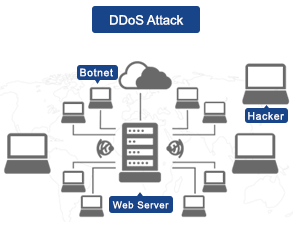 According to the 2014 Verizon breach report, the average DDOS attack size has grown 42% over the last year, from 7.4Gbps in 2012 to 10Gbps in 2013 and there is no sign that this trend will change. To further compound the issue, these bots are getting smarter. Around 30% of these DDOS bots can now accept cookies, making them harder for solutions to detect and block. 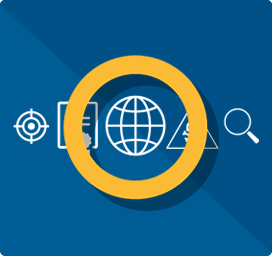 Incapsula takes the complexity out of securing websites and applications. Incapsula is a cloud service that includes a WAF, DDOS protection, a Content delivery network, and load balancing services. Incapsula works by using DNS redirection to route website traffic through the Incapsula Network. Once traffic is flowing through Incapsula, malicious traffic is blocked, and legitimate traffic is accelerated. This leads to a more secure, faster loading website. Incapsula works by using DNS redirection to route website traffic through the Incapsula Network. Once traffic is flowing through Incapsula, malicious traffic is blocked, and legitimate traffic is accelerated. This leads to a more secure, faster loading website. Incapsula built a massive network of data centers that can mitigate the largest attacks seen today (some attacks even reach 400Gbps and the average attacks go beyond 10Gbps, with 100+Gbps seen very often).  Incapsula offers unlimited protection, which means that any attack size will be mitigated without any impact on the customer’s network (most vendors limit the size of attacks to 10Gbps or 25Gbps). As opposed to other cloud service providers who only provide a service but use 3rd party technologies (e.g. Prolexic uses Radware appliances) Incapsula developed all the technologies it’s using from scratch and only uses standard servers and routers (no 3rd party technologies). This allows much more flexibility and rapid reaction to new threats and attack vectors. 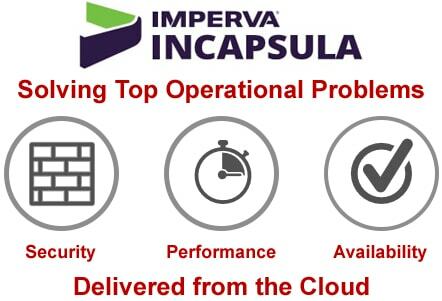 Incapsula’s 24×7 SOC is manned with security experts that can handle any attack in real time. In order to fight today’s sophisticated and constantly changing attack patterns. Easily defeats DDOS attacks of any size with a global 1.5Tbps scrubbing network. Automatically blocks any type of DDOS attacks (network, application, protocol, etc.). Won’t slow down websites, impact user experiences,or create false positives. In the last 12 months, we have seen a 240% increase in visits by DDOS bots. These bots are not only becoming more common but the attacks which they perform are steadily growing. According to the 2014 Verizon breach report, the average DDOS attack size has grown 42% over the last year, from 7.4Gbps in 2012 to 10Gbps in 2013 and there is no sign that this trend will change. To further compound the issue, these bots are getting smarter. Around 30% of these DDOS bots can now accept cookies, making them harder for solutions to detect and block. Client classification engine combats DDOS bots. WAF integration deals with multi-vector attacks. Transparent challenges ensure minimal false positives. Custom HW, SW, and algorithms. Complete control of system to defeat emerging and morphing DDOS threats. Fastest system-wide updates and custom rule propagation available.